Those who follow a healthy lifestyle may be oblivious to the Recommended Nutrient Intake for their daily diets. The Recommended Nutrient Intake, which is also referred to as the Reference Daily Intake, is a term generally used in regards to the majority (typically 98%) of healthy people in a particular stage of life and of a particular gender. The data covers the daily dietary intake level of a particular nutrient, such as vitamin A, calcium, iron, etc. Somewhere on the label of packaged foods, you can usually find the letters "RDI", which refers to the Reference Daily Intake of that product. What Does RDA Mean for Me? Is 5000 mg Liquid Vitamin C an Excess Amount? How is the RDI used? Daily values are calculated based on the nutrient intake figures in nutrition labeling, and most of these RDIs are based on the Recommended Daily Allowances, also referred to as "RDA", that were first established in 1968. Below is a list of Recommended Daily Intake amounts for each nutrient along with maximum amounts. As you refer to the list below, you'll notice the initials "IU" and "ug", which may be unfamiliar to you. "IU" refers to the International Unit, which is a unit of measurement for the substance amount. This amount is based on the biological effect of the product. The abbreviation "ug" actually refers to the "microgram", which is a measurement of 1/1,000,000 of a gram. It is considered one of the smallest units of weight or mass generally used. If you refer to the Recommended Nutrient Intake of the foods you buy, then you need to understand what "healthy eating" really means. While of course the general answer is "foods that are good for you", there is a more specific meaning. A food that falls into the "healthy" category, contains a limited amount of sodium and cholesterol. It should also be low in fat, particularly saturated fat. Foods that are referred to as "single items" have to provide at least 10 percent of one or more of the following nutrients: calcium, protein, iron, fiber, and vitamins A or C.
There are a few foods which do not have to fall into this category, and these include certain raw, frozen, or canned vegetables and fruits, as well as some cereal grain foods. These foods should not include any ingredients that change the required nutritional profile, however. Sodium content must also be considered, and foods that exceed 360 mg per serving will not qualify under this "healthy" term. lean-These foods should contain less than 95 mg cholesterol, less than 10 g fat, and less than 4.5 g saturated fat. extra lean-These foods should contain less than 95 mg cholesterol, less than 5 g fat, and less than 2 g saturated fat. reduced-The term "reduced" cannot be used for a product that is also billed as "low". It can be used if the food contains 25 percent less of a nutrient or of the calories in a regular product. less-This term is generally used when referencing a related food. 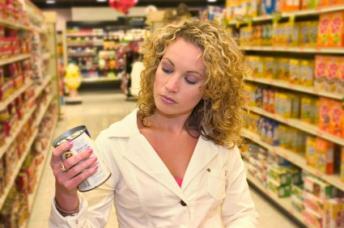 If one food contains 25 percent less of a nutrient or calories of a related food, it can be labeled as "less". light-"Light" generally refers to food that either contains one-third less calories or one-half the fat of the regular food. It can also refer to sodium content that has been reduced by 50 percent. Health conscious people often get into the habit of reading nutrient labels, and reading these labels and choosing nutritious foods can help you maintain a healthy lifestyle.